That’s the thing. They are not going to be able to get tyres which suit their non standard frame or non-standard suspension for a start. It is a shame, but that is the way it is. Come to think of it. It would actually be wise of them, to have the Tech3 outfit on Ohlins & a twin spar aluminium frame going forward. Like starting now. From the mans mouth: Lorenzo after getting off the Honda in Cheste: "I'm very happy"
Last edited by evo9; November 22nd, 2018 at 06:40 PM. There are some great photos at end of the article. Shows him riding different variants of the RCV. One photo clearly shows orange bodywork underneath the duck tail, with MM sticker shown. This bike is likely the 2018 version, and Marc's bike. I wonder if he also gets a ride on Dani's bike? Along with the 2019 prototype. Last edited by Barbedwirebikerr; November 23rd, 2018 at 02:08 AM. Got to agree with you there for sure. Their whole racing department I understand is made up ex HRC employees. They will need to steel some more from Ducati and HRC again to make the quantum leap. 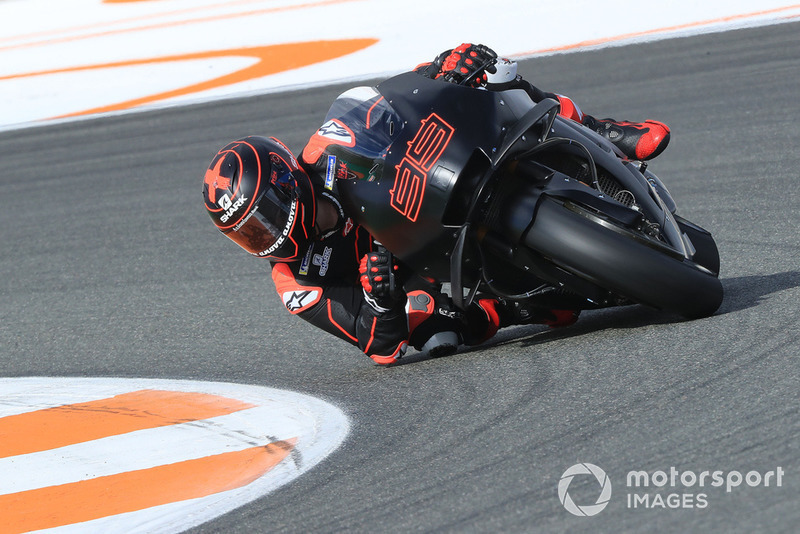 I remember Valencia test at the end of 2016. Lorenzo ended the test with Ducati 0.7~ seconds off the leader. When he passed the reporters, he proudly told to one of them, loud and clear: "I told you! I told you I could ride this bike!". The rest of the story we all know. Let's remember that he was jumping from 9 years riding Yamaha directly to Ducati. Now, he's jumping from a bike to another supposedly much more similar to each other. Supposedly indeed...Honda and Ducati are NOT similar to each other by any means. A mere look at the bikes already gives a good idea of that. Indeed, that's the reason I said "supposedly", because we can see how far it is from each other. Also, Valencia is a tighty and twisty track where the problems of Honda are covered by the track character. Even Ducati's famous understeering is not highlighted here. I can bet Lorenzo will struggle the whole year to make top 5. I will bet that Lorenzo will take a shorter amount of time to suss out the Honda and win a race on it than he did with the Ducati. For the Italian riders, 100%. Also because our moto medias are obviously very focused on our own riders, so even the interviews can be very insightful. For the Spanish it depends. I'd say most of the Spanish riders speak Italian very fluently (some, for example Marquez, sound almost native) and due to the several similarities bewteen the two languages I think it's easier for them to describe feelings on the bike and so on. Case in point here, my wife is Italian, her best friend is Spanish and they talk in their native tongues and understand each other.